Super tasty, easy, and healthy Cheddar Cheese & Pea Fritters that are gluten-free and baby led weaning + kid-friendly to boot! 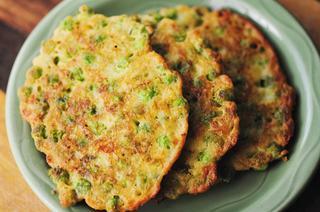 These crunchy & wholesome fritters are a great way to use that bag of peas sitting in your freezer! And with the addition of yogurt for some extra heartiness and calcium, these fritters make a great snack or meal any time of day...and are especially enjoyed by the little ones! Do you want to make these delicious fritters baby friendly? Instead of just mixing the ingredients, blend them in a food processor or blender until smooth before cooking! You can replace the cheddar with any shredded cheese of your liking. I do not recommend replacing the flour with another, as the texture would be completely different. I like to use this gluten-free all purpose flour. You can play around with the spices here, though I find them complementary to the peas and cheddar. You can use fresh chopped parsley rather than dried. I haven’t tested it, but I find most fritter recipes to work well with replacing the egg with a flax egg, if so desired. These gluten-free fritters taste best freshly cooked, but in a pinch you can prepare ahead of time and refrigerate for up to 5 days. To re-heat, place into a 400 F oven and bake for 10-15 minutes, or until warmed throughout. Super tasty, easy, and healthy Cheddar Cheese & Pea Fritters that are gluten-free and kid-friendly to boot! In a large mixing bowl, combine all of the above ingredients, mix until just combined.Heat a lightly oiled skillet over medium heat.Using a spoon or an ice cream scoop (my preference), scoop out about 2 tbs of fritter batter and shape into patties using your hands.Place onto your greased skillet & cook 3-4 minutes each side, or until desired golden crispness is achieved.Serve alone, or with your favorite condiment!Enjoy.